Much of the information out there about SBG is written form the standpoint of teaching revolution at the school level and worthy idealism. But, much of it is not really practical for traditional grading school teachers who want a philosophical change in grading and believe that SBG is best for their students. Saying things like HW should not count, zeros should not be given, or a 4 point scale should be used may all be true but not realistic, especially when your whole school is not converting to SBG. There are a lot of great teachers using traditional teaching, who are more effective than SBG teachers doing it in a sub-par way. Something to think about. Whatever you choose, you should still strive to be the best, effective teacher possible, to provide the most learning opportunities for your students. My reality is this: I work in a Charter school system (Fulton County) that is 70 miles long and we have around 7,500 teachers that serve around 96,000 students. My school (Centennial High School) is a wonderful place that teaches around 2,000 students each year. We are proudly heterogeneous in our population. I started teaching there 18 years ago and began using SBG 2 years ago (this will be my 3rd year). As far as I know, I am the only one teaching SBG in the county (I may not be aware if this is different). I teach AP and honors biology and teach 5 classes using 52 minute periods. I have a planning period and an hour for lunch each day. Overall I teach around 130 kids. My school is very willing to allow teachers to have flexibility in how they teach as long as it is based on sound pedagogy. I am greatly constrained by the Fulton County grade book, standardized testing, and the traditional school setting found county-wide. I will not be telling you here how to do SBG or how to develop it for your teaching. I am going to give you some things to consider that are based on my SBG experience teaching in a traditional learning setting. Do not get fired. You need a job and people depend on you. Don’t be a martyr for SBG. The last thing you need is to think something is cool and then launch into it thinking it’ll all work out. Don’t do it because 9 other people on Twitter say it’s awesome or you read a book and feel bad about yourself. You are probably already a very effective teacher. Understand why you are doing this. Do your research into the pedagogy justifying SBG as a worthy way to teach. Be prepared to explain to others (perhaps your boss, kids and parents) why this is at least an equal method as the one already in place. Be prepared for not everyone thinking it is such a great idea. People like status quo. Standards. Do you understand them? Can you unpack them? Are you restricted by what you have to teach and when? Do you have autonomy to break them down into manageable learning objectives? Do you know how to write assessments and properly score them in the style of your chosen SBG method? Know what you can’t do. Along with #1, know the limitations you are faced with. Make a list of your ideas and see if you have to cross any of them out because of your system’s/school’s constraints. There is no “one size fits all” SBG. Three major questions: 1. What do you want your SBG classroom to look like?, 2. What do you value in assessing learning using SBG?, 3. How will you track it and explain it to your stakeholders? Stop! if you don’t know the answers to #5, and re-read numbers 1-4. Figure those out first. Formative. Much of SBG by nature is formative assessment. Can you do this most of the time without converting to a number? How will you formatively assess? How will you communicate the assessment results to kids and parents? Will you have to attach a grade to this? How will that work? Summative. Do you give high stakes tests, unit exams, a final? How do these fit into your system? How will you deal with things if the formative SBG does not match with the summative results. How will you explain to your stakeholders? Grade book. How will you implement SBG tracking or grade reporting into your system issued grade book? This is often the hardest part of doing SBG in a traditional setting. Your school system most uses percentages on a 0-100 scale in the grade book. Something like a grade must be in that grade book as communication between you/parents/system. Do you have the choice to use a different system like a 4 point scale? There are SBG grade books out there which are really nice like Active Grade and JumpRope or even spreadsheet tracking. Can you use these without losing your job? Will you have to pay out of pocket? Does your administration/ parents/kids understand how you are using it and why? Pacing. How will you deal with the learning pace as it slows down? No one really mentions this when implementing SBG. If you are going for mastery/proficiency, how will you pace your class if kids are not understanding? Do you have autonomy to go at your own pace? How are kids who do not master learning objectives or standards remediated? Work and Time. SBG takes a lot of time and it is a lot of work if you are in a traditional setting. For example: developing everything from scratch, writing tons of feedback, working to get everyone to understand what you are doing and buying in, reassessments/retakes/redos, entering in SBG type proficiency scores and converting them to a numerical average in the traditional grade book. I’ll be honest and say my work load went up tremendously. Hours upon hours of more work. Too Much Too Soon. Don’t implement SBG the year you are implementing a bunch of other things like apps, programs, software, portfolios, turning your class into a game, etc. Doing too much at once is detrimental. My first year of SBG i also introduced, Active Grade, a Google drive management system, new proficiency levels, Class Dojo and Remind. Not good. Be patient and do a little at a time. Start Slowly. I would advocate that you implement SBG (if you are on your own) over 3 years. I would be traditional mostly the first year and begin reading, asking questions, getting permissions and developing your method that first year. You can still start doing things like more formative assessment, feedback and focusing on standards no matter what grading style you use. In year two I would begin the transformation by teaching more in the spirit of SBG and tracking your kids on your own to see if this is even more effective than what you are already doing. In year 3, I would go full Monty. I did not solve your problems here. I am not negative about SBG. I am trying to be realistic. My advice is meant to be practical. Maybe if I write more I will share resources and ideas but you will not get very far by just using someone else’s methods. With something as serious as assessment and student learning you have to develop a skill set that you can defend if needed. I believe about half of what people tell me about their classes on social media (unless I know them well), and it sometimes helps me with SBG related chats where the conversations tend to be idealistic. In the meantime, you have some summer time to ponder and consider. Perhaps some of this was helpful in some way. Thanks for reading. This entry was posted in Uncategorized on June 16, 2015 by Bob Kuhn. At the time I wrote this I was pretty set in not doing pure SBG for another year. As survey responses continued to come in, things balanced out and ended up actually in support for SBG. I will take the summer to reflect on how I can adjust the SBG portion of the course and improve some things per the student feedback I received. one of the biggest issues is Active Grade. It is a great tracking device for SBG but my school system does not use it. I pay for it and have kids/parents use it as a way to visually track progress. This is great if they actually do it. More troubling is the fact that i have to convert the SBG (Active Grade) portion (40%) to a numerical grade in the system grade book. I end up updating it every 2 weeks. I have to use a formula to do this and it is really time consuming. So, I am considering keeping up with Active Grade as a purely formative measurement and counting weekly quizzes as summative checks on learning. This means the Active Grade proficiency levels would not be converted, but if they are realistic should be demonstrated on the quizzes. Reassessments would still be allowed but for quiz objectives only. I am not sure about this but the amount of weekly work to run SBG around a traditional system is too much at this point. If i am to continue with it, something has to give. About 3 years ago I decided to turn my teaching upside down and adopt standards based grading/learning. I believed then, as I do now, that the spirit of SBG is the way to teach and learn. I poured my heart and time into it, researched and questioned, tweeked and adapted. I am sure even with all of that there were things I did incorrectly. My discovery after 3 years of doing it is that is no more effective in my case than traditional learning. I have not seen big gains in student achievement, kids have repeatedly told me they dislike it, and in terms of time it has been a huge burden. Kids did not reassess as hoped and many did not track their progress. It was too complicated. I have liked it as a way of learning and teaching. If I did not have to be subversive to do it, if kids and parents understood why it is a good way to learn, and if it was not so hard to implement in a traditional learning environment I would have liked it more. I feel in my heart that it is the right way to learn. I simply have not seen it as an effective way to do things in my school culture. I will probably incorporate the best parts into a hybrid type of learning environment in future years. There are many applications of SBG that do quite well in a traditional environment. Getting kids and parents to actively buy in and monitor their own progress is very difficult. They do not want “one more thing” to look at to figure out where they stand. 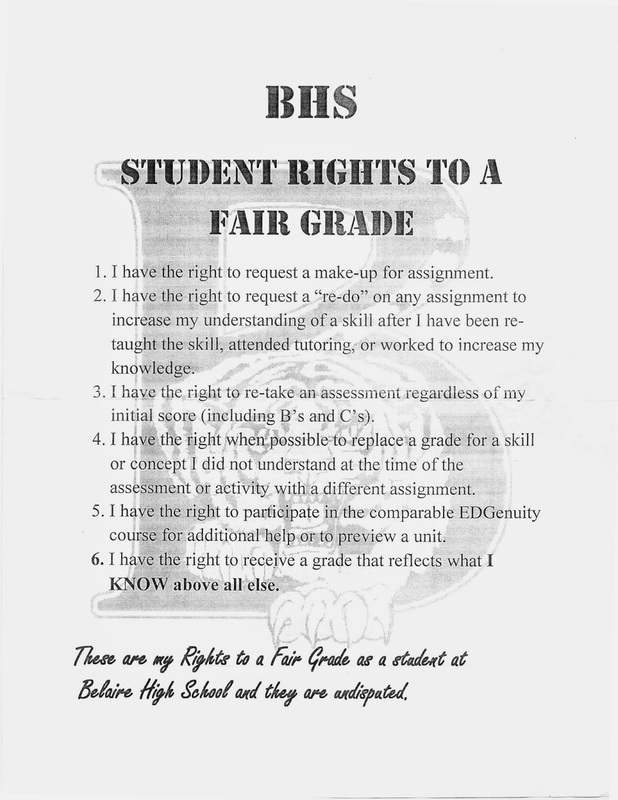 They do not want to use a formula to convert a SBG proficiency score into a numerical grade. I don;t really want that either. I feel I can be more effective being a traditional/hybrid SBG teacher that either of them separately. I feel that if you do not push yourself to try new things, take risks and innovate then you are doing it wrong. Have these 3 years been a waste of time? No way. I am not saying that it was a poor way to teach or learn. I think kids learned a lot this way whether they perceive it or not and in a different way. I think it has made me a better teacher. I think the kids benefited most from being reflective and thinking about how they learn. One aspect they liked was reassessment. I will find a way to keep that as well as other aspects of SBG. In no way is this a judgement on SBG as a whole. There are so many different ways to utilize it in a classroom and i do not feel my way is the only way or the best way. At the heart of what I want to do is talk to kids more about what they know. I want them to own their learning. I am strongly considering digital portfolios next year as a step in this direction. I also want to conference with kids and have them self-assess more often. There are other irons in the fire as well. I don’t think you can ever stop trying to innovate in education. I am proud of what we did in the past 3 years and they were 3 of the best years in my 18 year career. This entry was posted in Uncategorized on May 13, 2015 by Bob Kuhn. We are starting DNA replication which can be somewhat arduous at any level of biology. So, I looked for an opening question to formatively check for advanced understanding so I knew what I was up against. In this form I did ask for student names so i could eventually talk to them about misconceptions. How does the structure of a DNA molecule inform us about how it is replicated? You may be able to see that the answers are really diverse. Really diverse. There are some great misconceptions here as well. This shows 4 out of 130 anticipated responses. Google forms will pie graph most of the responses for me and I’ll have a nice spreadsheet data base of the answers. This gives me a great place to start and begin asking questions. Just one example of how Google forms are very useful in teaching and learning. I heard I was up to 9 people now who read this “blog”. Better stop now before I lose one. I mean, blogs are dead, right? This entry was posted in Uncategorized on February 9, 2015 by Bob Kuhn. At the risk of falling into a jargon trap, I try to provide a “growth mindset” in the classes I teach. I believe that a student’s brain learns over time. Neural connections are formed as learning takes place and kids eventually retain the ability to show this through evidence. I don’t believe that kids are just smart or dumb, even though many of my kids believe this about themselves. I believe that learning is a process and kids that go through that process (if they are patient) come out ahead in the long run. I was like this in school too. Never possessing innate natural ability or head of the class smarts, I struggled and had to learn how to train my brain, put in hard work and get close to those who were bright. The dangerous ones have always been those very bright folks who work just as hard. Point is, some kids don’t feel like they are works in progress. They often think that having to work hard is beneath them and that it equates to being a loser in some way. Im not going to go into the reasons for this because Carol Dweck did it for me. You should read that. So, best I can do is allow kids a chance to have second chances and demonstrate mastery over time. The 14 year olds I get in August are different learners by December or by May. I try to allow them the opportunity to show progress, grow and work hard. The AP kids also need to know that a course and a test have no bearing on them as human beings, nor does it represent everything they have learned. They too need the encouragement to grow, probably most of all. Problem is, many of them expect to get it right always the first time, many have never made a B and never expect to. So some will absolutely not ask questions, thinking that asking questions means you are dumb. Still, some of them give up when faced with a number they don’t like or when presented with a thinking, conceptual challenge that is not rote memorization. I really wish I had them for 4 years. How do we get these particular kids out of this cycle? We can’t. They eventually have to do it. But they need teachers to wear them down on allowing room for growth and emphasizing the learning journey and not the grade; focusing on the process, valuing their improvements and stressing hard work and never giving up. I do have kids that have this mindset already and I don’t want to make it sound like all of my students are in the same boat. I trained with a power meter for 7 years on my bike. My coach coached elite athletes and I was lucky he took an interest in me. He never focused on placings only my power improvements, my perceived improvements, and provided me with structured guidance built on growth and progress. The power meter was my mistress and she was a total jerk. Doing the work was the fun part. Improving and focusing on doing things better each race became more important than the race itself. Listening to my body and watching myself improve was so fulfilling. Growth mindset. I had myself going there for a second. Anyway, I think 6 people read this now so I can bow out nicely now. I think you get where I am coming from. This entry was posted in Uncategorized on January 12, 2015 by Bob Kuhn. I want students to be able to show that if they make mistakes, they can work towards correcting those mistakes. I want them to know that (especially in biology) concepts are formed over time in their brain, so mastery of learning is a fluid thing. They should be able to show positive growth if they are motivated to do so. I do provide opportunities for class retakes on the most missed learning objectives (LO) on more formative weekly quizzes. Kids get an optional retake sheet with their next quiz. They have to know which LO they have not mastered and they have to have done the bridge learning needed to master these. Summative test retakes are a tougher nut. Some think that summatives should be non-retakable since they are supposed to show final learning of a set of LO. There is pain up front, but the idea is that the kids and their parents know that the teacher expects kids to be prepared for the summative. Others, allow retakes as long as students work though their mistakes and show evidence of their learning. This is quite an undertaking and only motivated kids will probably take advantage. Normally kids get some fraction back of what they correct. These retakes are not the rule, but the exception and at the discretion of the teachers. Others advocate that retakes are a right and anything can be retaken during the semester as long as there is evidence of re-learning. My problem with the first idea is that even if I make a test that I believe is fair and inline with both the LO and the learning I have monitored in class leading up to the summative, there are too many variables to control outside of that. If the class average comes back a 65 or you look at scores and kids and some perform well below what you think they should have, I feel that kids should have the option to better themselves. If a kid makes a 35 on a summative, you can teach them that there is pain associated with that mark or you can teach them that although there is pain there, if they have the motivation to learn what they missed they can recover. Which is more motivating? I find that pain is less motivating then second chances. That said, as the teacher is it my responsibility to offer when needed. Setting this as overall policy leads to kids relying on the make up. I do use a periodic retake policy that is quite detailed and requires a lot of effort. Kids have to identify their mistakes, explain them and then explain why the correct answer is correct. But, as kids work though the test I find that they become empowered and appreciate the opportunity. They also get to see the difference between simple mistakes and things they did not learn. Not reading a question correctly or answer choices correctly is a mistake. Overlooking a question they forgot to answer is a mistake. Running out of time is a mistake. Not understanding the learning it took to answer a question is not a mistake. I find that this is incredibly helpful to them. Test retakes should be the exception to the rule and serve a purpose for re-learning, not re-scoring. I do allow individual reassessments on specific LO. Since LO are assessed in may ways, kids can make an appointment to come in and reassess one skill a day for the entire semester. The smart thing to do is to reassess soon after receiving my written feedback and having done the bridge learning needed for mastery. Otherwise kids wing it, reassess, and find they did not improve or perhaps slide back. Kids have to show me evidence of their bridge activities in order to do the reassessment. There is a fine line with providing opportunities and asking for evidence of preparation. The bridge should naturally be intrinsic, but often this is not in the student’s own economics system. So, asking for evidence of re-learning is good, unless it stops kids from trying to reassess. Making it easy to have opportunities is great, but by adding a need for evidence you make it less of a way for kids to wrangle for the symbol of the mark or grade. Asking for evidence might stop some kids from reassessing, but on the other hand they might just learn more. Also, master up front and reassessment is a moot point. Reassessment should be the exception, not the rule. Kids should only be reassessing for mastery. This entry was posted in Uncategorized on January 11, 2015 by Bob Kuhn. From my post to the AP Biology Community. Feel free to comment here or reply on Twitter. A few days ago Brad Williamson replied to another post about an activity for EK3, LO 30 on the evolution of HIV. This was originally published way back in 2005 and now is made a bit easier by the nice online phylogent/alignment tools out there. 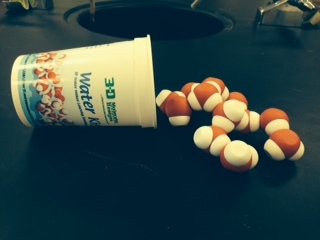 I was experimenting with the more open inquiry activity. This activity is based on real data (unfortunately) from multiple HIV patients who were IV drug users. 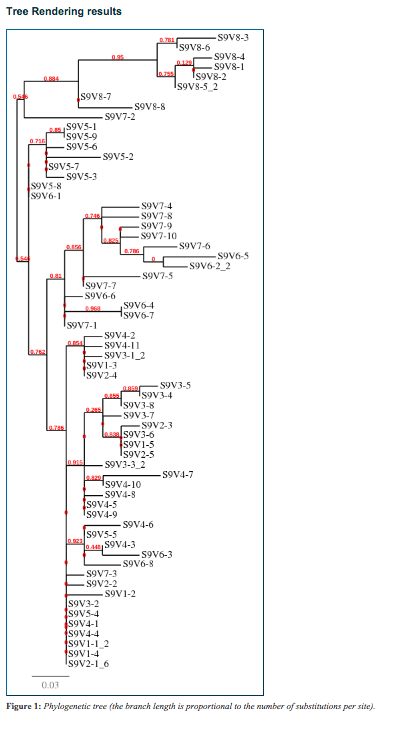 The data set contains sequences from HIV clonal data and also gives their CD4 counts as well. The activity can be found HERE and the data set HERE. So I put my student hat on and decided to run some experiments. I decided I wanted to see if there was any relationship in HIV gene diversity and CD4 decline over time. I picked Subject 9 who has 8 visits to the clinic from 1989 to 1993 and never missed a visit. In this same time period, the CD4 values declined from 489 to 270. So, wise community, help a brother out with this tree. In looking at it, it looks like the root of the tree shows 1 substitution and as diversity increases (more substitutions), the tree trends out to the right with the clade at the top (visit 8 mostly) showing the greatest amount of genetic diversity. Meaning, that during visit 8 the subject’s HIV had a greater diverstiy of genes becaue of high mutation rates then back in 1989 in visit 1 (base of the tree). Please let me know if I am way off base here, on the right track, or if there are other things I am missing. The original paper published on this data set can be found HERE but it is pretty technical (at least for this paleontologist). I appreciate your time and feedback! This entry was posted in Uncategorized on January 2, 2015 by Bob Kuhn.